Just like your life, your job becomes more and more demanding. More and more jobs will be obsolete or automated in the future. The myth of the irreplaceable specialist has long been busted. Professional productivity teaches you techniques and give you tools and tips for maximizing the results and minimizing your efforts. First of all, your work week is usually constraint to 40 hours or less and in most countries working overtime is not tolerated. Nowadays you are connected all the time and you receive new tasks by email, phone, text message, instant messenger and the social networks. These tasks need to be managed. Then you have to also learn to prioritize your tasks, goals and all other stimuli if you ever what to get hold of your live. There is a great deal of decision-making involved in the process. As in your personal life, education will be an ongoing topic. There is hardly an industry that does not call for a constant learning process. You have to keep your core skill, but you also have to acquire new skills and knowledge. That would keep you competitive. All these requirements force you to search for help in terms of productivity. There is no better employee for any company than the one who is able to retrieve the required information faster than the others and who is able to provide the answers needed better or more complete than the others. 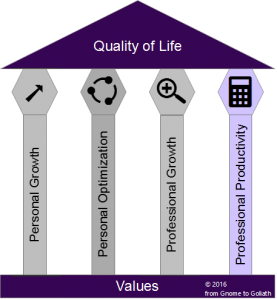 Mastering the professional productivity pillar will give you the upper hand in comparison to your colleagues or competitors. It is safe to assume that to a certain degree everybody outside your family and maybe outside your inner circle of friends is a competitor. Along with competition, however, comes cooperation. Big rivals in markets with only two competitors could cooperate in order to penetrate a new country or continent. By mixing competition and cooperation you could grow as a professional, but you could also help your community to grow.